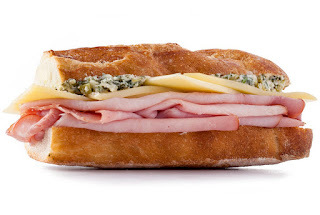 Ham and cheese sandwich is one type of sandwich commonly found in various countries. 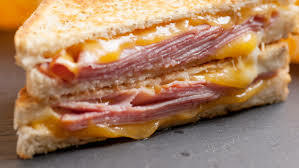 This is made by adding cheese and ham slices between two slices of bread. Bread is sometimes smeared with butter and or baked. Vegetables such as lettuce, tomatoes, red onions, or pickled slices can also be included. Various types of mustard and mayonnaise are also commonly added. Sliced bread, sliced cheese and cooked ham slices are very easy to find in Western supermarkets and as a result ham and cheese sandwiches are fast and easy to serve. They are a common component of packed lunches.